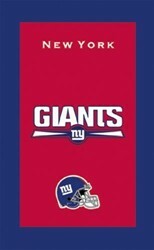 Support your favorite team with this colorfully designed towel. Towel is absorbent and a large size, love it. My average hasn't gone up yet, but I am hopeful! Due to the time it takes to produce the KR Strikeforce NFL Towel New York Giants ball it will ship in immediately. We cannot ship this ball outside the United States.